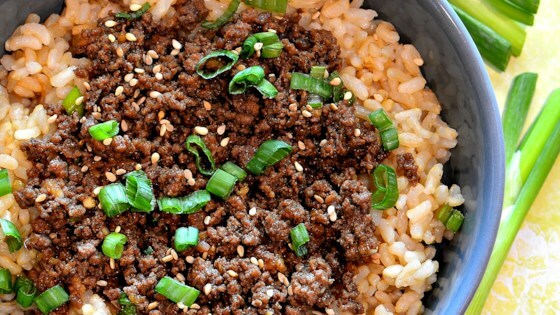 "Korean beef bowls are quick and easy to make. The ingredients can easily be adjusted to suit your taste. Serve over warm rice or spiralized vegetables." Heat a large skillet over medium-high heat. Add beef and cook, stirring and crumbling into small pieces until browned, 5 to 7 minutes. Drain excess grease. Add garlic, ginger, and sesame oil, stirring until fragrant, about 2 minutes. Stir in soy sauce, brown sugar, and red pepper. Cook until some of the sauce absorbs into the beef, about 7 minutes. Add 1/2 of the chopped green onions. Serve beef over hot cooked rice; garnished with sesame seeds and remaining green onions. I made it to the recipe, but rather than over rice I made it as an appetizer and served it on lettuce leaves as a wrap. Our guests loved it. I would make it again and serve it the same way.